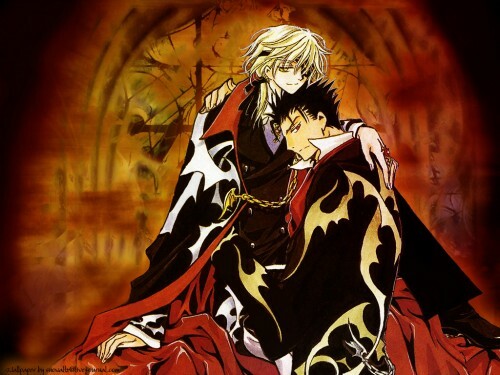 Featuring Kurogane and Fai from Tsubasa Reservoir Chronicle. Original scan is from the colour splash of Ch141, scanned by ladydarkmoon (on LiveJournal). Manip of the scan took 1 day. I brought Kurogane nearer to Fai, put his right hand on Fai's shoulder and left on Fai's waist. I also redraw Fai's left leg so that it looks more comfortable for him. The background of the wallpaper took another day. It's something like an eerie church feeling, so as to associate with Fai's vampire status. Dedicated to Jx and my KuroFai flist. Comment if you like it, thanks! Another nice wallpaper of Fai and Kuro-kun. Lol, as soon as I saw this I knew it was you. Pretty decent editing job, but Fye's leg sticks out, it looks photoshop-made. Pretty awesome filtering on the image. Lots to improve on, but great job, keep up the good work ;). lovely scene ^_^ but you should work on the "colour" of those two a bit, they are still looking like an unworked scan, just outcutted. Hi there! This is such a love photomanip! It makes them seem so close! *sigh* The lighting looks awesome too! I all around love it! Yeah! kurogane! fye! love it! thanks! kurofai is great! especially kuro-sama..